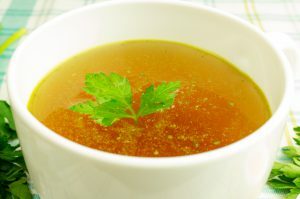 Homemade bone broth has tremendous health benefits. It literally heals the lining of your gut. It aids in nutrient digestion, helps your body fight infection, and even contains glucosamine, which reduces inflammation and joint pain. Additionally it contains calcium and magnesium to help bones repair. What about store bought broth? Well, the stuff in stores typically contains MSG or other chemicals, and even if it doesn’t, the nutritional value doesn’t even compare to homemade. 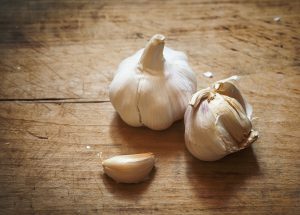 While you can use it in cooking, it lacks many of the health boosting benefits. Also, it costs more than making your own. Both in the short term (go ahead- do a cost analysis), and the long-term (hello…stave off illness, doctor visits, and medications). Have you tried making your own bone broth yet? If not, why not? You wouldn’t believe how easy it is. I make it every week. Every. Week. And if I have time for it with two little ones and a couple of businesses, so do you. It literally takes 5 minutes prep time, and around 2 hours of cook time (pressure-cook) or 24 hours (slow cook). Check out my previous post on making bone broth from a whole chicken – it’s delicious! That recipe was easy, and it’s what got me into this golden deliciousness in the first place. But sometimes I don’t have time to de-bone a chicken, and just want to throw things in a pot. I like just throwing things into a pot and it turning out delicious – makes me feel like I’ve accomplished something, and always impresses hubby! So here is a super simple way to make bone broth in your Instant Pot (and if you’re not an Instant Pot believer yet then you are really missing out. At this point you should be using an Instant Pot. Period.). *Note: I get my beef bones from a local farmer who sells grass-fed beef. Many farmers will be happy to sell bones separately, and they’re usually really inexpensive! ** you want your broth to gel once it’s been in the fridge! That’s a sign of high nutrient quality, and it’s great! If yours doesn’t gel, it’s still nutritious so don’t throw it out; try adding more bones next time! Strain broth, discard bones and veggies. Store in glass jars in fridge.